Venezuela and China signed accords Tuesday to increase the flow of Venezuelan oil to China, increase Chinese investments in Venezuelan telecommunications and agriculture, and double the size of a previously established joint investment fund. “Our relationship with China has become highly strategic on the political, economic, scientific, and military fronts, a very intense relationship, and we came to continue strengthening it,” said Venezuelan President Hugo ChÃ¡vez upon arriving in Beijing Tuesday, his fifth visit since being elected president nearly ten years ago. Mixed commissions made up of government and private industry officials from both countries moved forward on plans to construct joint oil refineries in China’s Guandong province and Venezuela’s Orinoco Oil Belt. 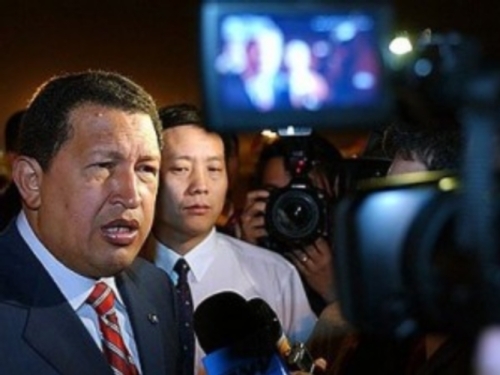 In a statement Wednesday, ChÃ¡vez projected that Venezuelan oil exports to China will increase from the current 331,000 barrels per day to 1 million barrels per day by 2012, to fuel China’s rapid growth and diversify Venezuela’s export markets. The two countries also plan to build a fleet of tankers and expand shipyards to transport this oil. Venezuela currently sells a third of its daily oil production, more than 1 million barrels per day, to its biggest customer, the United States, but has steadily diversified its markets both within and outside of Latin America, many times with reduced prices and payment terms favorable to poor or vulnerable nations. China and Venezuela also agreed Tuesday to double the amount of capital in their joint investment fund, bringing the total amount in the fund to $12 billion. The fund is meant to fund development in agriculture, infrastructure, communications, education, industry, and culture. In addition, the Chinese companies ZTE and Haier signed accords to manufacture cellular phones and domestic appliances in Venezuela, according to Venezuela’s minister of basic industries and mining, Rodolfo Sanz, who accompanied President ChÃ¡vez in Beijing. Simultaneously, a shipload of tubing from China arrived in the Port of Maracaibo in northwestern Venezuela, part of an earlier agreement to improve water distribution in Venezuela’s dry Guajira region. “China is supporting us in railway materials, watering systems for the national agricultural system, and also in technological sciences,” said Haiman El Troudi, the Venezuelan Planning Minister, who was also in Beijing. Such knowledge transfer is included with the telecommunications satellite that China has produced for Venezuela. 180 Venezuelan doctoral students and specialists have been trained to manage the satellite, which is on schedule to be launched this November 1st, according to statements Tuesday by the Venezuelan minister of science and technology, Nuri Orihueja. “We are breaking down barriers, breaking down borders, demonstrating our capacity for technological autonomy,” said Orihueja. China and Venezuela re-established diplomatic relations more than three decades ago, but interaction between the two countries has grown drastically during ChÃ¡vez’s term in office. Commerce between China and Venezuela has increased from $200 million in 1998 to 5.8 billion dollars in 2007, and ChÃ¡vez estimated this week that commerce would reach $8 billion this year. When asked why he is not attending the United Nations summit in New York this week, ChÃ¡vez said it was “more important” for him to be in China than in New York. “Besides, I am not being missed… new voices are being heard,” he said, mentioning specifically Argentine President Cristina FernÃ¡ndez, Bolivian President Evo Morales, and Brazilian President Luiz Inacio Da Silva, who are in New York.